Interviewing the best of the Storytelling Community. Inter-faith ceremony is an opportunity to merge the richness of our traditions and deepen our understanding and faith through the open doors of diversity. Beyond my accredited Masters of Divinity from a Christian University, I have been blessed with a vast exposure to great teachers; the greatest teachers of all being the beautiful souls beside in Hospice. My ordination promise is to serve God’s love in it’s infinite spectrum. That is why my commitment to your love-story is a necessity to your authentic ceremony. Love is the most important choice in any given moment. The moment of your marriage is the most sacred of all. You become family, growing the new branch of your merged family trees. When I build a ceremony with you, the elements of your personal story are an essential to what becomes the “living-truth” of that collective moment. Every precious soul in attendance is valued, participating, honored, most especially your families. I do not do the old classic “Dearly Beloved” format. The beauty present is too valuable. Certainly I have my own style of officiating, but the ceremony is uniquely yours. It has to be. This requires a long meeting together;¦ lots of fun; no pressure on you! All ideas are welcome to the table. I have great resources to assist and inspire your choices;once again, no pressure! I tell my couples; “Your ceremony is already written on your hearts. It’s up to me to pull the threads of your story, and go home to weave the tapestry of what your ceremony will become. Only the actual moment itself, will truly define the divine living-truth of your love.” Personally, I believe there are no coincidences when we connect. It is a great honor to serve your love, and a privilege to stand with you on that sacred threshold as you become family; it is the greatest thing we do in our human walk! This entry was posted on Friday, August 10th, 2007 and is filed under Creating Success, Environmental Storytelling, Episode List, Healing Storytelling, Storytelling in Ceremony. You can follow any responses to this entry through RSS 2.0. You can leave a response, or trackback from your own site. I like the idea of “setting up the domino’s” so that the stories already written on the audience members’ hearts come to realization. The respect for both the groom’s and the bride’s family trees made prominent is such a potent directive! 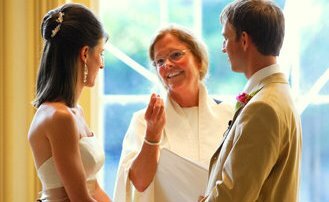 I liked imagining the bride and groom, enacting an important symbolic gesture, as they approach the altar together apart from their parents. I am recommending your interview to a good friend, storyteller, and Unity minister! Brennan Guion on Dylan Pritchett – What Makes a Great Storyteller? Barbara holm on Mary Jo Huff – Early Literacy Begins with Rhythm Rhyme & Story Time. Carol Brown on Dylan Pritchett – What Makes a Great Storyteller? Beth Doan on Dylan Pritchett – What Makes a Great Storyteller?